I'm grateful that social media has picked up the torch for the 2014 Chibok kidnappings in Nigeria and run with it, forcing major media outlets like ABC and CNN to respond with more coverage of the missing girls. The situation is far from over though. Holding up #BringBackOurGirls signs shows solidarity with the parents of the kidnapped children, but also creates a false sense of comfort that things are getting done. I've chosen a picture of First Lady Michelle Obama to illustrate my point in this editorial for two reasons. The first and admittedly obvious one is that it's a public domain photo because of her work by and for the United States Government. The second reason is because I have a tremendous admiration for the tireless and thankless work that all First Ladies do as ambassadors, educators, dignitaries and diplomats. Their work is often overshadowed by their Presidential husbands but is no less important to U.S. citizens. Even when our government's actions and policies can embarrass us on the world stage, a First Lady's grace and dignity never does. 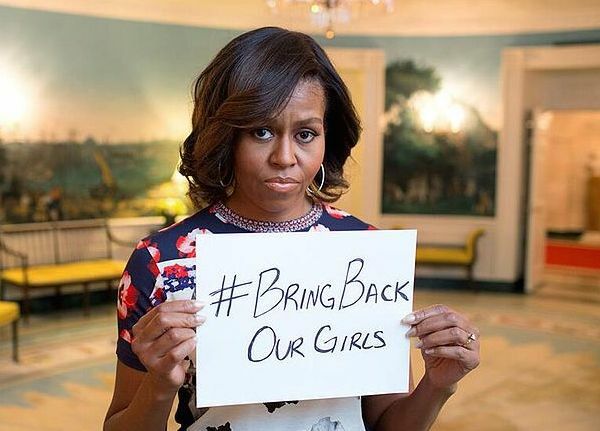 For that reason I feel that The Honorable Michelle Obama has nothing but the greatest intentions with her #BringBackOurGirls photo - and to that degree I applaud her for trying to raise awareness about the kidnappings. Someone once said to me though that if you put good intentions in one hand and manure in the other, you'd quickly realize which one carries more weight. It's a smelly metaphor you're unlikely to try to put to the test, but it's also not hard to visualize, probably because you can imagine how bad your hand would smell. The world response to this kidnapping stinks too. I don't think the United States or the so-called "West" can be held solely accountable, even though the U.S. has resources they could put to the task of finding the missing girls that other nations don't. The problem is really a matter of perspective where average people aren't connecting with the families of these girls, and you can hardly expect world governments to pick up the torch if their citizens aren't outraged to begin with. Everybody needs to stop for a moment and really internalize how having a loved one kidnapped would feel - a wife, a daughter, a son or a partner taken away at gunpoint and held against their will in a harsh and unforgiving environment. Stop and imagine it. Now that you've got the proper perspective on this situation, resign yourself to the fact that #BringBackOurGirls just doesn't cut it. In fact writing an editorial like this one doesn't cut it either. Social media has the unfortunate side effect of making people feel like they've actually done something without really making a difference at all. If you've allowed yourself to feel any emotional connection to the Chibok kidnappings, don't just trend the hashtag on Twitter. Call or write your elected officials and ask them "What are we doing and why aren't we doing more?" If you already work in government and happen to be reading this, ask the same questions of your fellow citizens. We need more than hashtags. We need boots on the ground, we need actionable intelligence, we need these girls to be reunited with their families. Just imagine men with machine guns showing up at your children's school in your neighborhood, suburb, town or village. You'd want more done about it than a retweet. A special thank you goes to my friend James B. McDaniel﻿ for inspiring this editorial.